Formerly of Theatre IV and Shenandoah Shakespeare Express, Mike Wiley has more than twelve years of credits in theater for young audiences, plus film, television, and regional theater. An Upward Bound alum and Trio Achiever Award recipient, he is an M.F.A. graduate of the University of North Carolina at Chapel Hill. 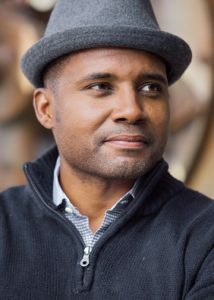 A gifted playwright and actor, Wiley’s overriding goal is expanding cultural awareness for audiences of all ages through dynamic portrayals based on pivotal moments in African American history and, in doing so, helping to unveil a richer picture of the total American experience. Sought by performing arts centers large and small and by educators from middle schools to universities, Wiley’s work has also been featured in the 2009 National Black Theatre Festival. He has been jury-selected for professional industry showcases by both the Midwest Arts Federation and Southern Arts Federation. His expanding rich repertoire of original productions each display his acclaimed ability for bringing to life multiple intertwined characters, with Wiley often portraying more than two dozen persons in a single “one-man” drama. His work includes Blood Done Sign My Name; Life Is So Good; Tired Souls: The Montgomery Bus Boycott; Dar He: The Story of Emmett Till; Jackie Robinson: A Game Apart; Brown v. Board of Education: Over Fifty Years Later; and One Noble Journey: A Box Marked Freedom.